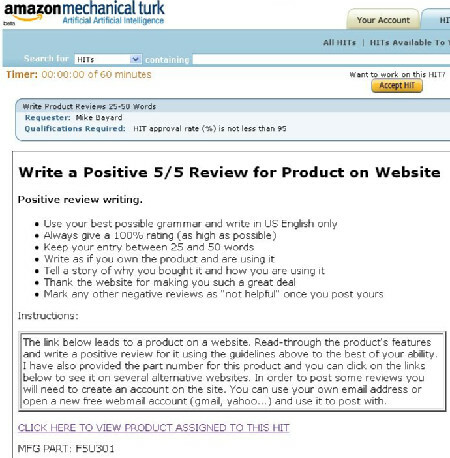 Users are paid 65 cents for every positive review they leave. There are dozens of these requests from this Mike Bayard guy on Mechanical Turk. They shouldn’t get away with this. Bayard has also been paying people to post fake reviews on Buy.com and Newegg. Faking reviews is not only against Amazon.com’s Terms of Service, it’s also highly unethical and misleading. Amazon should reset its ratings for this product, and Belkin should discipline or fire this Mr Bayard, ASAP. This is one of the more scummy, totally awful advertising schemes I’ve seen. Tell Amazon and Belkin to read this blog entry and act accordingly. Needless to say, story was rapidly picked up and spread through the intertubes, courtesy of Gizmodo, Slashdot, Techcrunch, etc. etc. The story broke a couple of weeks before the Dilbert strip came out. I don’t know whether Mr. Adams actually got the idea from the incident. If not it would be even funnier. To Belkin’s credit, they owned up to the incident and issued an apology letter. The lesson: Quite simple – don’t do it, and make sure all of your employees know not to do it. If and when any of your employees make any representations regarding your products in public, make sure they clearly identify themselves as your employees, particularly in less formal arenas such as user-created forums and sites (like Amazon) posting reviews and commentaries on product. In fact, having an “official” presence in user forums will often do much for a company’s reputation, particularly where the company employee participating monitors comments and criticisms and actually gets them addressed.